Former Bloomberg TV anchor, Sergio Cesario, the president of The Cesario Group, a Broker Associate at Douglas Elliman Real Estate in Miami Beach, FL has been awarded the Seller Representative Specialist (SRS) designation, the premier seller agency designation in the country. 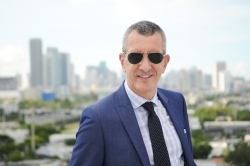 Miami, FL, February 14, 2019 --(PR.com)-- Sergio Cesario, the president of The Cesario Group, a Broker Associate at Douglas Elliman Real Estate in Miami Beach, Florida has been awarded the Seller Representative Specialist (SRS) designation, the premier seller agency designation in the country. The SRS is conferred by the Real Estate Business Institute and is an official credential of the National Association of Realtors. Cesario joins an elite group of real estate professionals from around the world who have earned the SRS designation. All were required to successfully complete comprehensive coursework in seller representation, demonstrate significant seller representation experience and expertise, and abide by the strict Realtor Code of Ethics. Sergio Cesario is a Certified International Property Specialist (CIPS) and an Accredited Buyer Representative (ABR®) and has been a local real estate agent for 5 years. He is a former anchor from the business powerhouse Bloomberg TV Brazil and holds a Master's Degree in Journalism from New York University. Most of Cesario's clients are foreign nationals and global residential real estate investors. Cesario has extensive real estate experience in South Florida and Lisbon, Portugal, specializing in beach and condo properties. Cesario's seamless international experience of more than 30 years distinguishes him from the competition in representing a wide range of customers. Leveraging from Douglas Elliman Real Estate and Knight Frank Residential's global alliance, Cesario has access to an invaluable database and the largest interactive and connected network for luxury residential properties in the world. This alliance of shared history, vision and commitment to a demanding clientele allows Cesario to reach out to first-time home buyers coming from different parts of the world, buyers looking for investment properties, and people looking for second homes or the finest international properties. He offers unique marketing strategies to all his customers, an all-in-one experience whether in Miami, Manhattan, Lisbon or Sao Paulo.